John of Gaunt, 1st Duke of Lancaster was born 6 March 1340 in Ghent, East Flanders, Flanders, Belgium to Edward III of England (1312-1377) and Philippa of Hainaut (1311-1369) and died 3 February 1399 in Leicester Castle, Leicestershire, England, United Kingdom of unspecified causes. He married Blanche of Lancaster (1345-1369) 13 May 1359 JL in Reading, Berkshire, England, United Kingdom. He married Constance of Castile (1354-1394) September 1371 JL in Roquefort. He married Catherine De Roet (1350-1403) 1 January 1397 JL in Lincoln Cathedral. Notable ancestors include Henry II of England (1133-1189), William I of England (1027-1087), Charlemagne (747-814), Hugh Capet (c940-996), Alfred the Great (849-899). Ancestors are from the United Kingdom, Spain, France, Germany, Portugal, Russia, Ukraine, Hungary, Belgium, the Netherlands, Italy, Turkey, the Byzantine Empire, Sweden, Belarus. He was the third surviving son of King Edward III of England and Philippa of Hainault. He was called "John of Gaunt" because he was born in Ghent, then rendered in English as Gaunt. Created Duke of Lancaster in 1362. Became titular King of Castile and León in 1371 upon his marriage to the illegitimate daughter of Pedro the Cruel. John of Gaunt's legitimate male heirs, the Lancasters, included Kings Henry IV, Henry V, and Henry VI. His other legitimate descendants included, by his first wife, Blanche, his daughters Queen Philippa of Portugal and Elizabeth, Duchess of Exeter; and by his second wife, Constance, his daughter Queen Catherine of Castile. John fathered five children outside marriage, one early in life by a lady-in-waiting to his mother, and four surnamed "Beaufort" (after a former French possession of the Duke) by Katherine Swynford, Gaunt's long-term mistress and third wife. The Beaufort children, three sons and a daughter, were legitimised by royal and papal decrees after John and Katherine married in 1396; a later proviso that they were specifically barred from inheriting the throne, the phrase excepta regali dignitate (English: except royal status), was inserted with dubious authority by their half-brother Henry IV. Descendants of this marriage included Henry Beaufort, Bishop of Winchester and eventually Cardinal; Joan Beaufort, Countess of Westmorland, grandmother of Kings Edward IV and Richard III; John Beaufort, 1st Earl of Somerset, the great-grandfather of King Henry VII; and Joan Beaufort, Queen of Scots, from whom are descended, beginning in 1437, all subsequent sovereigns of Scotland, and successively, from 1603 on, the sovereigns of England, of Great Britain and Ireland, and of the United Kingdom to the present day. The three succeeding houses of English sovereigns from 1399—the Houses of Lancaster, York and Tudor—were descended from John through Henry Bolingbroke, Joan Beaufort and John Beaufort, respectively. John was the fourth son of King Edward III of England. His first wife, Blanche, was also his third cousin, both being great great grandchildren of King Henry III. They married in 1359 at Reading Abbey as Edward III arranged matches for his sons with wealthy heiresses. Upon the death of his father-in-law in 1361, John received half his lands, the title "Earl of Lancaster", and the distinction as the greatest landowner in the north of England, inheriting the Palatinate of Lancaster. He also became the 14th Baron of Halton and 11th Lord of Bowland. John inherited the rest when Blanche's sister, Maud, Countess of Leicester (married to William V, Count of Hainaut), died on 10 April 1362. 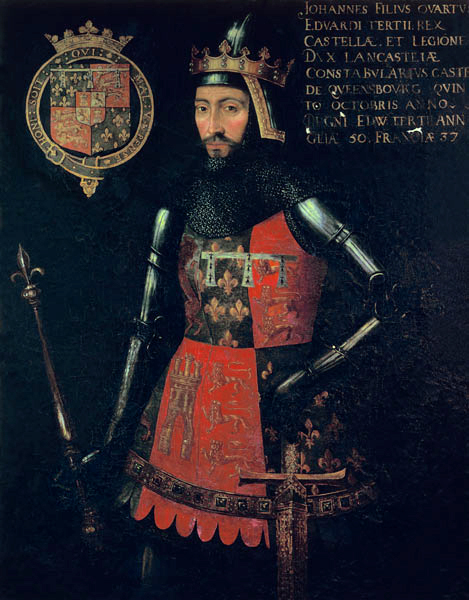 John received the title "Duke of Lancaster" from his father on 13 November 1362. He was by then well established, owning at least thirty castles and estates across England and France. His household was comparable in scale and organization to that of a monarch. He owned land in almost every county in England, producing a net income of between £8,000 and £10,000 a year (several millions in today's terms). After the death of his older brother Edward of Woodstock (also known as the Black Prince), John of Gaunt contrived to protect the religious reformer John Wycliffe, possibly to counteract the growing secular power of the Roman Catholic Church. At this time he exercised great political influence over his nephew, Richard II of England (1367-1400), during his minority. Blanche of Lancaster (1345-1369) - On 19 May 1359 at Reading Abbey, John married his third cousin, Blanche of Lancaster, daughter of Henry of Grosmont, 1st Duke of Lancaster. The wealth she brought to the marriage was the foundation of John's fortune. Blanche died of bubonic plague on 12 September 1369 at Bolingbroke Castle, while her husband was away at sea. Their son Henry Bolingbroke became Henry IV of England, after the duchy of Lancaster was taken by Richard II upon John's death while Henry was in exile. Their daughter Philippa became Queen of Portugal by marrying King John I of Portugal in 1387. All subsequent kings of Portugal were thus descended from John of Gaunt. Constance of Castile (1354-1394) - In 1371, John married Infanta Constance of Castile, daughter of King Peter of Castile, thus giving him a claim to the Crown of Castile, which he would pursue. Though John was never able to make good his claim, his daughter by Constance, Catherine of Lancaster, became Queen of Castile by marrying Henry III of Castile. Constance died in 1394. John married Katherine in 1396, and their children, the Beauforts, were legitimised by King Richard II and the Church, but barred from inheriting the throne. From the eldest son, John, descended a granddaughter, Margaret Beaufort, whose son, later King Henry VII of England, would nevertheless claim the throne. All monarchs of England and later of Great Britain, the United Kingdom and the Commonwealth Realms from Henry IV onwards are descended from John of Gaunt. Catherine De Roet (1350-1403) - During his marriage to Constance, John of Gaunt had fathered four children by a mistress, the widow Katherine Swynford (whose sister Philippa de Roet was married to the famous poet Chaucer, author of the Canterbury Tales). Prior to her widowhood, Katherine had borne at least two, possibly three, children to Lancastrian knight Sir Hugh Swynford. The known names of these children are Blanche and Thomas. (There may have been a second Swynford daughter.) John of Gaunt was Blanche Swynford's godfather. Marie de St. Hilaire of Hainaut (1340-1399) John's first child was an illegitimate daughter, Blanche (1359–1388/89). Blanche was the daughter of John's mistress, Marie de St. Hilaire of Hainaut (1340-after 1399), who was a lady-in-waiting to his mother, Queen Philippa. The affair apparently took place before John's first marriage, which was to his cousin Blanche of Lancaster. John's daughter, Blanche, married Sir Thomas Morieux in 1381. Morieux held several important posts, including Constable of the Tower the year he was married, and Master of Horse to King Richard II two years later. He died in 1387 after six years of marriage.